Budget preparation starts, abolishing pension and increase in pay suggested.The government has started budget preparations and commenced the consultation process with the concerned stakeholders including representatives of various chambers of commerce and industries and different business organizations. In this regard Prime Minister Shahid Khaqan Abbasi has reconstituted his own team for preparing the budget for year 2018-19 as government is in hurry and interested to complete the work before the completion of the term of the assemblies. The Prime Minister has appointed Haroon Akhtar Khan as his Advisor, with the status of Federal Minister, who will be responsible for the affairs of the Federal Board of Revenue (FBR), and consult with the business community to prepare the recommendations for improving the collection of taxes. The Prime Minister has also appointed Miftah Ismail as his advisor who will be responsible for dealing with the international monetary organizations for seeking loans and other financial assistance from them. To deal with political elements, the Prime Minister has appointed Rana Afzal Khan as Minister of State for Finance, who will deal with the politicians and other local organizations to seek their proposals for the next budget. 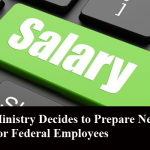 According to sources of Ministry of Finance, the government has been working on a plan to abolish the system of pension and the salaries of the government servants will be increased accordingly to the level of private sector so that the financial burden on the government for the payment of pension could be abolished. In this proposal, which will be very difficult to be adopted by the government in its last year of the tenure, the government has received suggestions that instead of giving pension, the government officials will be given handsome salaries so that they can save sufficient money at the time of retirement. The government has also discussed this proposal with the International Monitory Fund (IMF), the main lender of loans to Pakistan but still there is no progress on this proposal and it will be further discussed at various levels in the Ministry of Finance before the finalization of the next budget. Meanwhile, the government has also discussing the proposals to increase the funds for improving the basic needs of life including power, provision of water, gas, health facilities, education and other such basic facilities and huge amount will be allocated in the next budget so that they can seek the support of the people on the occasion of the next elections. The sources in the Ministry of Finance said that during the recent meetings of officials of Finance Department with the representatives of IMF, Pakistan has been advised by the IMF to prepare a three year frame work which include reduction on the foreign loans, prepare a comprehensive strategy for improving the debt payment in the next three years, as Pakistan has to pay back nine billion dollars during 2018 against the loans secured by the country. The IMF also advised the officials of the Ministry of Finance to chalk out comprehensive strategy and take adequate and effective measures to reduce the trade deficit which has increased to US dollars 36 billion. In this regard the financial team of the Prime Minister has also been asked to prepare recommendations for increase in the revenues by the FBR, give incentives to increase foreign remittances and other such options.